The Dark Ages is the best era - and here's why! 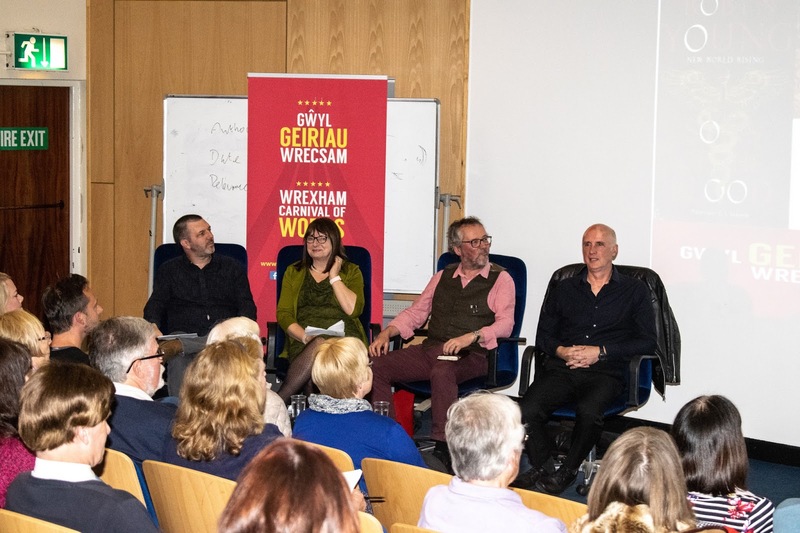 A fun talk at Wrexham Carnival of Words. This time last week I was at Wrexham in North Wales attending the Wrexham Carnival of Words festival. I was appearing as part of their popular Historical Fiction evening, sharing the stage with some wonderful authors. 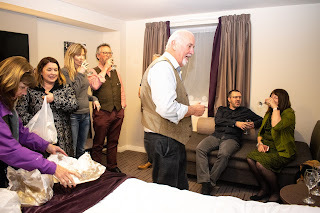 The first part of the evening was a relaxed buffet mingling and chatting with the Wrexham Writers Group, which was a fabulously relaxed affair with fun and enlightening conversations and some wonderful catering. 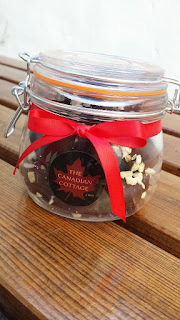 A special shout out for the Canadian lady who brought treats from her shop, The Canadian Cottage - the Peanut Butter Truffles are to die for, and they deliver all over the UK. 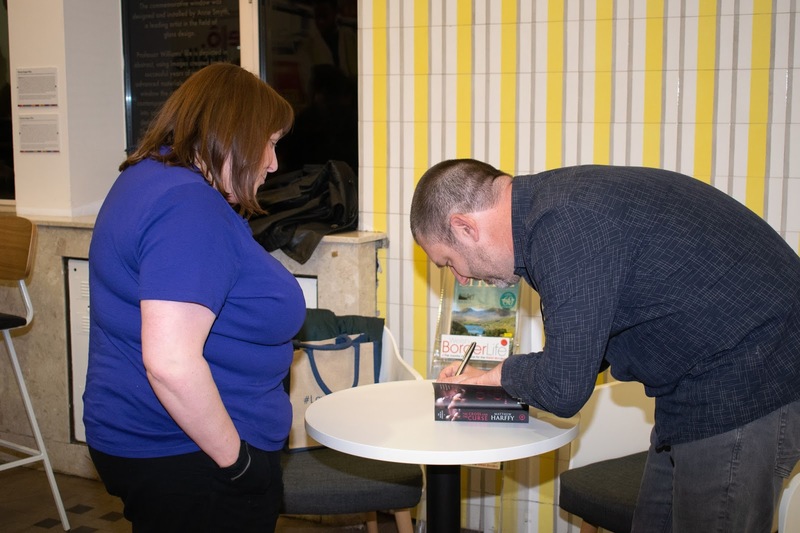 I had a lovely time, meeting the local authors and chatting all about writing and publishing. Then came the main event, which was split into two halves. 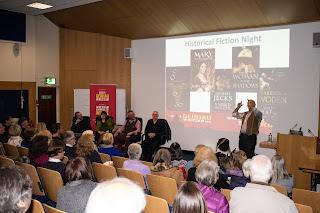 The night was compered by fellow historical fiction author, Dave McCall (who writes under the name, David Ebsworth). Dave was a wonderful host and ran the evening with just the right touch of humour and fun. 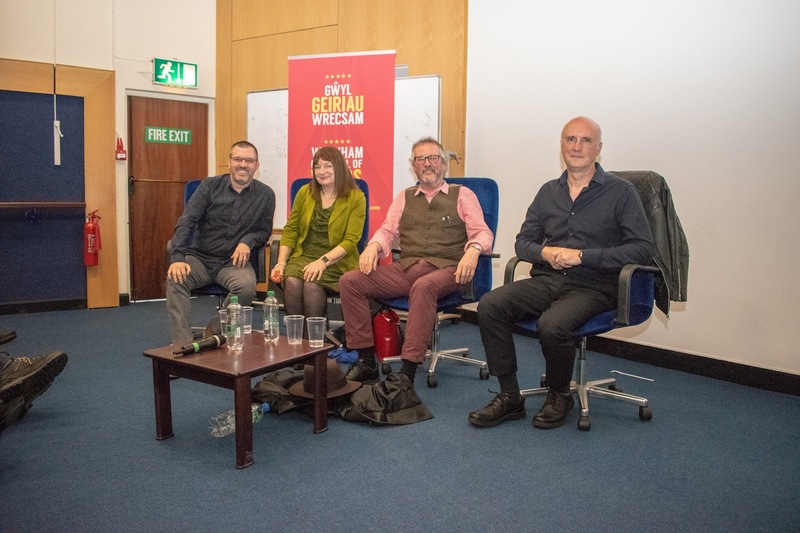 The first half of the proceedings was entitled My Era is Better than Yours, and it pitched four writers against each other, each trying to convince the audience that the era they write about is the best. I talked about the Anglo-Saxon Dark Ages and alongside me were Carol McGrath (Norman Conquest), Michael Jecks (The Plantagenet Apocalypse) and Tony Riches (The Tudors). Each of us spoke for six minutes, then there were questions from the audience, and then we were allowed a further minute to seal the deal. After that, the audience voted for their favourite era. Well, I rolled out my secret weapons, that were reciting some of Beowulf in the original Old English and then mentioning that, without the Dark Ages, we would not have had J.R.R. Tolkien's The Lord of the Rings. Needless to say, I won with a resounding majority of the votes! Not bad, considering, as I pointed out, the baddies in my books are often the Welsh! You can read my full talk at the end of this post. After a short break, Dave went on to interview Robyn Young about her novels and her journey as a writer. 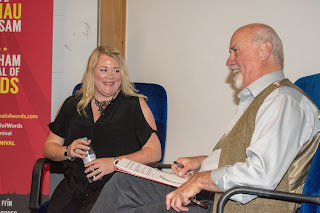 It was a relaxed, enlightening talk and the forty-five minutes flew by. Then we were all signing books and chatting, before heading back to the hotel for some wine and chips (apparently a tradition of the festival). Signing books is always a blast, though I forget how to write my own name! 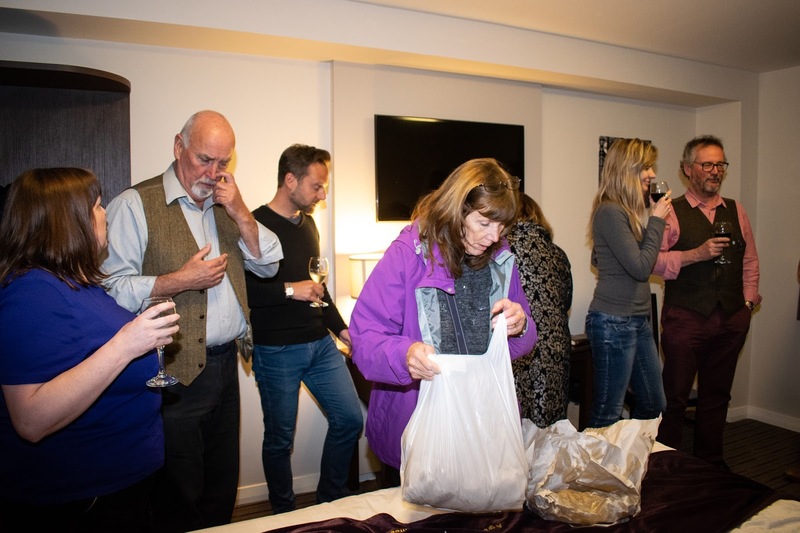 When we got back to the hotel, there had been a mix up and, despite the organisers having done the same thing for years, the new management of the hotel forbade us eating our chip-shop-bought chips in the hotel restaurant. So, after a few minutes of indignation, still basking in the glow of victory, I invited everyone up to my room. Greasy chips! On my bed?! What goes on in Wrexham stays in Wrexham! It was all very rock and roll. There was talk about throwing the TV out of the window, but in the end the party was over by eleven, leaving me with a room filled with empty bottles and glasses and reeking of chips! And some great memories of Wrexham. 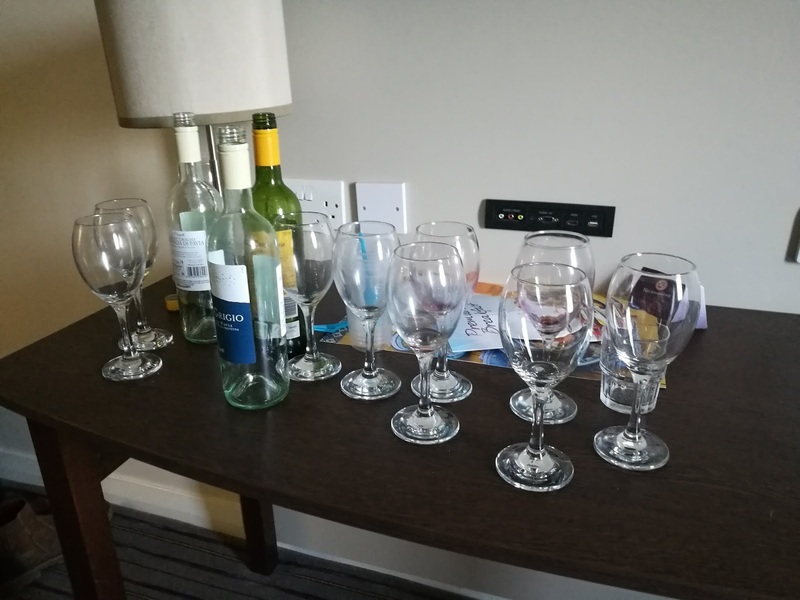 The aftermath of the after party! Being here in Wrexham is an honour, but I’m pretty sure that being here in Wales in particular is going to go against me. I can’t see how I can win because, although my era is of course better than all the others, my books are written from the perspective of the bloody Saes! Yes, the Anglo-Saxons, who become the English, are the main characters, and the Welsh are often the baddies! Of course it was the Anglo-Saxons who gave the Welsh their name, Welsh being the old English for foreign. You see the English penchant for disliking anyone different to them started long before Brexit! So why is my era the best? The early medieval, as it is known by historians and academics, is more commonly known as the Dark Ages, a term coined by historians centuries ago who saw the decline of the Roman Empire as a descent into darkness and a loss of education and learning. I like to call it the Dark Ages because nobody knows much about what was going on, especially in Britain. There are few primary sources and those there are, are pretty sketchy. All of this is great for an author! It is also sometimes known as the Heroic Age – and who doesn’t like a good heroic protagonist? how princely nobles performed heroes’ deeds! Epics like Beowulf, the oldest English poem, came from this period. And the seeds of the legendary tales of King Arthur emerged from the ashes of the Roman Empire. The greatest stories in the English language hearken from such a time of myth and legend, a time of scops singing their tales in the flickering light of smoky mead halls. All good stories need conflict and Dark Ages Britain is rife with it – Angles and Saxons clash with the native Welsh, Anglo-Saxons fight other Anglo-Saxons, they fight the Picts, they fight the Irish, and of course later, they all fight the Vikings! There were so many small kingdoms in Britain it was like a continent in miniature, providing a great scope for stories. Not only were there battles between the different kingdoms, there were clashes between religions. It is a period before Christianity had become the overwhelming winner in the battle for the hearts and souls of the people of Britain. The Anglo-Saxons worshiped the pantheon of gods that were the same as those followed by the Vikings in all but name. Thunor/Thor, Woden/Odin, etc. Christianity came into Britain from Ireland and Iona in the West and North, and from the south from Rome and France over to Kent and through the kingdoms of Britain. As I said before, conflict makes for great stories and here there was a new God promising everlasting life battling against the old pagan gods that demanded sacrifice. Even the two strands of Christianity were in conflict. Culminating in the Synod of Whitby in AD 664, where such exciting things were discussed as the calculation of the date of Easter and the type of haircuts that monks should have! Heady stuff indeed! The Dark Ages cemented so much of what we know today in our day to day lives. The names of the days of the week come from the gods - Woden gives us Wednesday, Thunor gives us Thursday, Tuesday is from Tiw, the God of war. Even the counties in many areas come from the kingdoms of pre-conquest Britain. Sussex for the South Saxons, Wessex for the West Saxons Essex, the East Saxons, Mercia, Powys and Gwynedd… all have their roots in the Dark Ages. Even the name 'Wrexham' may possibly trace its etymological origins back to this period as being derived from an Old English name, 'Wryhtel' and 'hamm' meaning water meadow i.e. Wryhtel's meadow. And Wrexham was almost certainly founded by Anglo-Saxon Mercian colonists in the 8th century. So without the Dark Ages and those bloody Saes, we wouldn’t be talking here today! With all the great battles and action you might be forgiven in thinking there is no place for women, but you’d be wrong! Women don’t have a great time in some of my books, but unlike later in history, it was an enlightened time in many ways. On marrying (which didn’t have to be done in church, by the way – after a couple plighted their troth and were hand-fasted, they were married). On getting married women were given a bride gift, which was theirs alone to do with as they pleased and they were also allowed to inherit and own land and wealth. Although the history of the era is crowded with kings, warriors and priests, there are also powerful women who commanded great influence, women such as Hild, the Abbess of Whitby, of the famous Synod. And others, such as Queen Eanflaed and her mother Ethelburga, who are often mentioned as having profound influence on the men in their lives, often changing the course of the politics of whole kingdoms. Nothing changes! I am sure Melania is running the United States of America! Of course, as I said before, the Dark Ages are really the Early Middle Ages and apart from the lack of electric light, they were not that dark at all. If you look across the whole period you can see exquisite craftsmanship such as that seen in the Sutton Hoo burial and the Staffordshire Hoard, and of course the Lindisfarne Gospel and the Book of Kells were produced by monks in the British Isles in a time that is infamous for its lack of education. If you look wider, over the rest of the continent, the Moors bring algebra and advances in medicine and science in this time, and there were massive innovations in architecture across Europe. In short, with its epic poems, the works of great craftsmanship, the impacts on our everyday language and place names, the Dark Ages still burn brightly in our history and our collective psyche, not to mention they still enthrall us and are a great backdrop for gripping novels! And that is why my era, The Dark Ages, is the best! The others have talked about Shakespeare, and Boccaccio and Chaucer and the Domesday Book. I bring you an author better than any of those. The best author of the twentieth century! J.R.R. Tolkien! The Dark Ages is a time of enlightenment and progress, as well as a huge amount of conflict. An era of great kings who stood in shieldwalls alongside their retinues of brave warriors. Kings like Oswald of Northumbria, who was part of the inspiration for one of the greatest works of fiction of the 20th century. In JRR Tolkien’s Lord of the Rings, Aragorn, son of Arathorn, the exiled King of Gondor, who returns to claim his birthright, is based on Oswald. On talking about the time when the epic poem Beowulf was written, Tolkien described it as “a time that has now for ever vanished, swallowed in oblivion”. It is an era, he said, that is to us “as a memory brought over the hills, an echo of an echo”. I think the echoes from that distant time still resonate today, particularly in the British Isles where people speak a language that after so many centuries still has essential kinship with that spoken by the Anglo-Saxons. Beyond our language, we share many other characteristics with the men and women who recounted sagas and told riddles around the hearth fires of feast halls. Some would say we are still a bellicose people, and we certainly still like a good drink. But above all of that, just like those Dark Age forebears, all of us here tonight like a good story. Unless otherwise stated, all photographs copyright Phil Burrows.